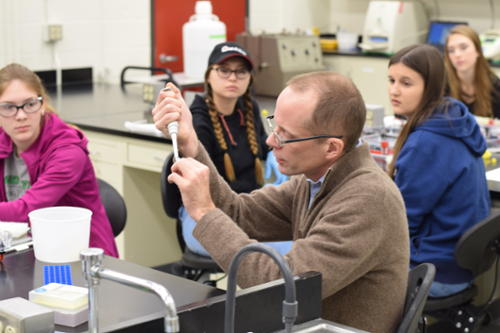 In early January 2018 the Department of Biology hosted Advanced Placement Biology students from Wayne High School. This is the third year their teacher Mr. Nolan Flores has brought his AP class for full day experiences. The primary goals of these visits are to support the teacher’s curriculum--for example, with equipment and reagents not available at the high school--and to provide the students with an interesting and positive college experience. The department has been holding high school class visitations for several years. In addition to achieving our goals, they are fun and satisfying events for our participating faculty, postdocs, graduate students and undergrads. Engaging with community members on the topic of biology, which of course is our primary area of expertise, is a win-win affair for all participants, and for our larger mission to improve science literacy in our schools. Hosted by Dr. Michael Clark, who coincidentally is a Wayne High School alumnus, the day began in the museum room, surrounded by specimens from the historic Ward collection. After introductions and refreshments (always a good ice breaker), the students were split into Blue and Gold groups for morning laboratories on either DNA gel electrophoresis or bacterial transformation. The labs are designed to provide insight into how these important techniques are used in the real world and, just as important, hands-on experience with research-grade equipment and reagents. About the labs, one of the students Katie reported, "I liked how we got to see the content we learned in class applied in a real-world laboratory setting. It helped make class more relevant and understandable." After morning labs, the students toured the research laboratories of Drs. Brisson (molecular basis for phenotypic plasticity in the aphid), Larracuente (intragenomic conflict and the evolution of selfish DNA in Drosophila) and Bergstralh (morphogenesis of epithelial tissues in Drosophila and mammals). Prior to their visit, the class read about the research in each of these labs and had many questions. After visiting the research labs, they broke for a pizza lunch with undergraduates and graduate students in the Hutchison Hall Green Lounge. After lunch the students attended their afternoon labs before gathering for closing comments and their bus ride back to the high school. The laboratories, taught by Dr. Clark and Nicole Dawney, a PhD student, were supported by undergraduate teaching assistants, Ryan Grimes, Fatima Shah, Chase Quatela, Rachel Yang and Martha Hoffman. The research lab tours were guided by graduate students Xiaolu Wei (Larracuente lab), Mary Grantham (Brisson lab) and Nicole Dawney (Bergstralh lab). In summary, Mr. Flores commented on the value of bringing his AP students to the department, "For me it's all about establishing that connection between school and higher education. I love to see my students interacting with the professors, TA's and graduate assistants. In just a few short hours my students begin to realize that college is not at all an intimidating place, but rather a very interesting and exciting place with the potential to open doors to a brighter future."